Officer Gordon Grant in "baby blue," his unmarked patrol car. 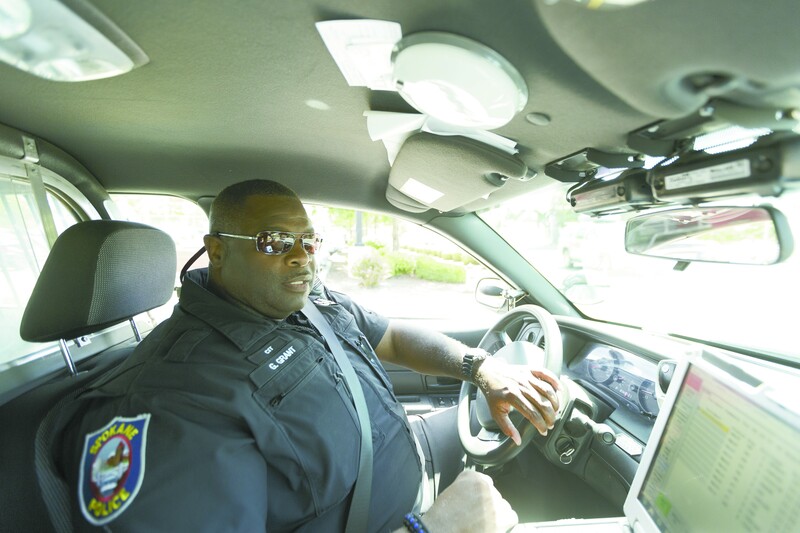 Gordon Grant, the almost-30-year Spokane police officer, is somewhat of a local celebrity. Grant grew up in Spokane (he went to Ferris High School), and despite his youthful ambitions to find a law enforcement job elsewhere, he landed back in Spokane after a year playing football in Canada. Ask a long-time Spokanite about Officer Grant, and they might tell you about having him as a D.A.R.E officer or talking with him at Cops 'n Kids, the community event he's organized for the past 22 years. But one story you might not know about Grant starts with the desktop image on his computer. It's of Grant with his arm around Samuel L Jackson. "Just chillin' with my homeboy," Grant says, showing off the picture one June morning. When Jackson was in Spokane filming 2006 flick Home of the Brave, he needed someone to drive him and his crew around town. He specifically asked for someone who was intimately familiar with the city. He wanted someone who knew where to go and, more importantly, where not to go. When Jackson travels to a new town, he likes to patronize local restaurants. One of the first things he asked Grant after arriving in Spokane was where to get some "serious soul food." "How serious you mean?" Grant said. "'Cause I can call up Momma right now." "Nah, I can't ask your Momma to cook for me," Jackson replied. So Grant introduced him to CHKN-N-MO. Jackson was hooked instantly. "Oh, it's on, I'm eating here every night!" Jackson said. Jackson is a big golfer. Grant suspects Jackson makes sure all his movie contracts include a clause stipulating a certain number of hours of golf he must play. So when it came time for the weekly round, Grant was invited along. Word spread quickly once Jackson stepped onto the tee box, and by the time they reached the 10th hole at Downriver Golf Course, the fairway was lined with spectators like it was a PGA tournament. "It gave me a window into the pressure that these guys experience in a real tournament," says Grant, who shanked the first ball on the 10th into the woods right before a representative from Nike approached their group. The rep approached Jackson first. "Man, all my stuff is Adidas," he said. "But my driver, Gordon, over there, he loves Nike." The rep let Grant test drive a brand new driver for the rest of the round. After the 18th, when Grant tried to give it back, the guy said he could keep it. Not wanting any special treatment, Grant insisted on paying for the new club. That's how he ended up with a $400 driver for $75 bucks. "It was so sweet," Grant says. One night, Jackson and the cast of Home of the Brave went out to blow off a little steam. Grant suggested Vin Rouge. As the night drew on and the drinks continued to flow, the cast grew louder. Several people turned in their chairs and began to grumble. When Jackson noticed, he stood up. "Ladies and gentlemen, I'm sorry if we're being a little loud tonight," he said. "My name is Sam Jackson, I'm an actor. Please allow me to buy everyone's dinner and bottles of wine tonight." "That was one side of Sam I got to see a lot of," Grant says. "He was a serious actor, but he's also a person with a very strong heart." Grant is hesitant to name names when it comes to specific places to avoid, but generally he told Jackson to stay away from far-north Spokane — an area of high crime without as many restaurant options as the downtown core. Overall, Grant says, it was a great experience getting a peek into a celebrity's lifestyle. And word of his skills as a chauffeur must have spread because he drove Cuba Gooding Jr. around a few years later.